IAMBRIGITTE : MAC by Request is back! MAC by Request is back! You voted. We listened. M•A•C By Request is back for a second year! What’s old is new again, and the most beloved shades from the 90s and 2000s have returned for an encore performance. 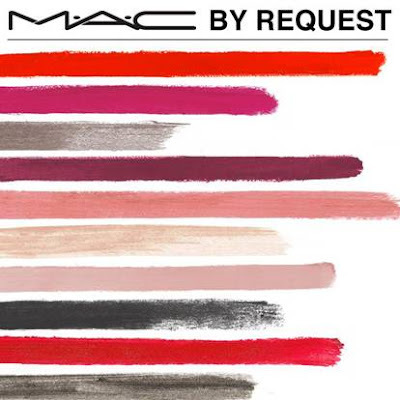 M•A•C is bringing back highly-requested retro-classic, long-lost lipsticks and eye shadows. Starting on July 8th — vote on Facebook for your favorite shades and the six (3 lipsticks and 3 shadows) with most votes will return in Spring 2014. What are you waiting for? Go to MACCosmetics on Facebook, cast your vote and bring back some shades from its fabulous past. Remember, only one vote per category, per person -- per day. And you have until the 21st of July to do so! I just did today and I voted for Hoop and Butterscotch!